Namibia is a land of other-worldly landscapes of breath-taking scale and splendour. With a dramatic geological past, and an arid climate shaped by the effects of the frigid Benguela ocean current which sweeps along its coastline, this sparsely-populated country in the southwest of Africa is home to a wide array of largely-rural peoples, rich biodiversity, and unique ecosystems. It harbours the oldest desert in the world, impressive arrays of rock art which stand as cultural monuments to the San who occupied this land for centuries, desert-adapted elephants, the largest free-ranging herd of black rhinoceros in the world, and an astonishing abundance of other wildlife. Namibia has established a network of national parks and other protected areas that forms the cornerstone of efforts to conserve the country’s remarkable wildlife and other biodiversity, and serves as the engine that drives rural development. Game parks and conservancies are the centrepiece of the country’s tourism industry, which is the mainstay of Namibia’s economic development. 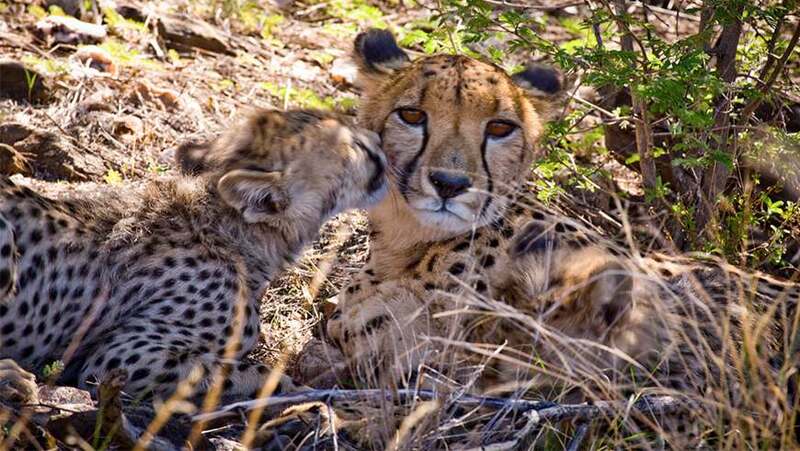 Wildlife is not restricted to these protected areas, however, and in most parts of Namibia people and wild animals co-exist in shared landscapes. Namibia is working to take conservation beyond traditional boundaries to prevent loss of biodiversity, reduce human-wildlife conflicts, and avoid land degradation and consequent economic decline. With the support of the United Nations Development Programme (UNDP) and the Global Environment Facility (GEF), and other partners, the Namibian Government is working to lift conservation barriers and advocate for the establishment of a large-scale network of protected landscapes in which landowners and conservation authorities work together to manage ecosystems at a large scale. Three UNDP-supported projects between 2004 and the present – amounting to a GEF investment of some US$17 million — have built on each other to unlock the potential of Namibia’s protected areas, while contributing to social development. The first of these projects, Strengthening the Protected Area Network (or SPAN), worked to develop important national policies that enable more effective management of Namibia’s natural assets in ways that yield win-win returns for both people and wildlife. These policies include the Human-Wildlife Conflict Management Policy and Parks and Neighbours Policy, which provide guidance on how to deal with human-wildlife interactions. The ground-breaking Tourism and Wildlife Concessions Policy provides a best-practice model for engaging communities as custodians and beneficiaries of protected landscapes through a system of concessions. In Namibia, as much wildlife exists outside of national protected areas as within them. The NAM-PLACE project (the Namibia Protected Landscapes Conservations Areas Initiative), worked to establish Landscape Conservation Areas (LCAs) that are built on the premise that local residents are custodians of wildlife and should manage these resources to their mutual benefit. The LCAs bring under conservation management different land-use units (protected areas, privately-owned farms and community-managed conservancies), in ways that enable members to benefit directly from the revenues derived from tourism concessions. A bonus of this system is that extra revenues are reinvested in maintaining the conservation areas. As a result of these interventions, the Namibian Government and people are increasingly realising the value of protected areas and wildlife for the country – not only as important cultural and natural resources and part of the national heritage, but also as a major asset for sustainable development. A new set of challenges linked to an upsurge in rhino poaching and illegal wildlife trafficking are now being addressed through a third UNDP-supported, GEF-financed project: Strengthening the Capacity of the Protected Area System to Address New Management Challenges, which works to strengthen the monitoring and enforcement system and its capacity to deal effectively with wildlife crime.